Vacationing Book Nerd Style: Hamilton in NYC! 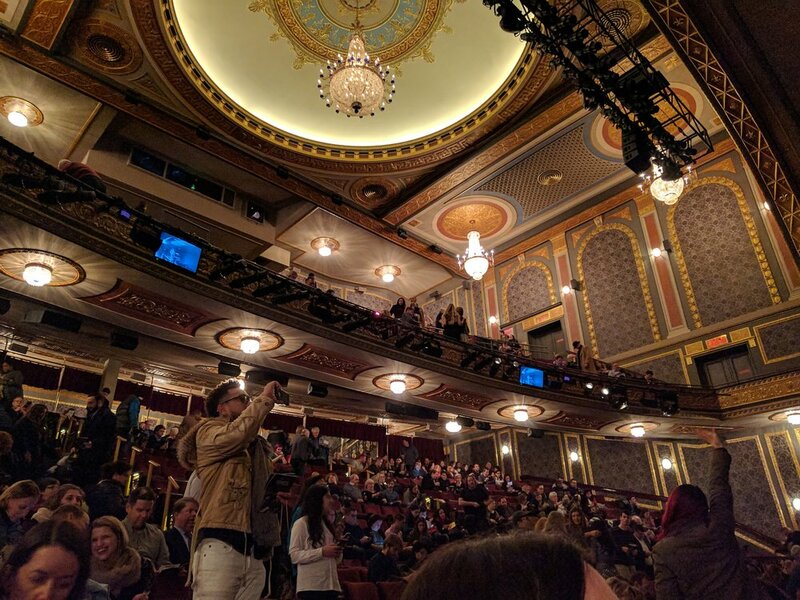 I saw Hamilton on Broadway!!! As Lin-Manuel would say, it was a bit of a day. I can’t believe this was my life for the past week. Our trip was pretty much a book nerd’s dream. We stayed in a hotel that used to be a library and had books in every room. 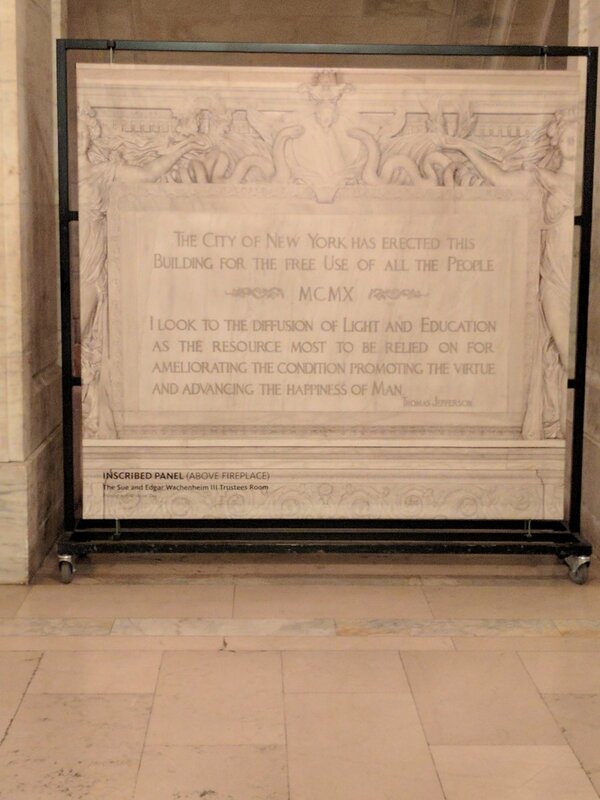 We toured the flagship New York Public Library. We bought books (and got a little lost) in The Strand bookstore. We had some super delicious pizza and beer. 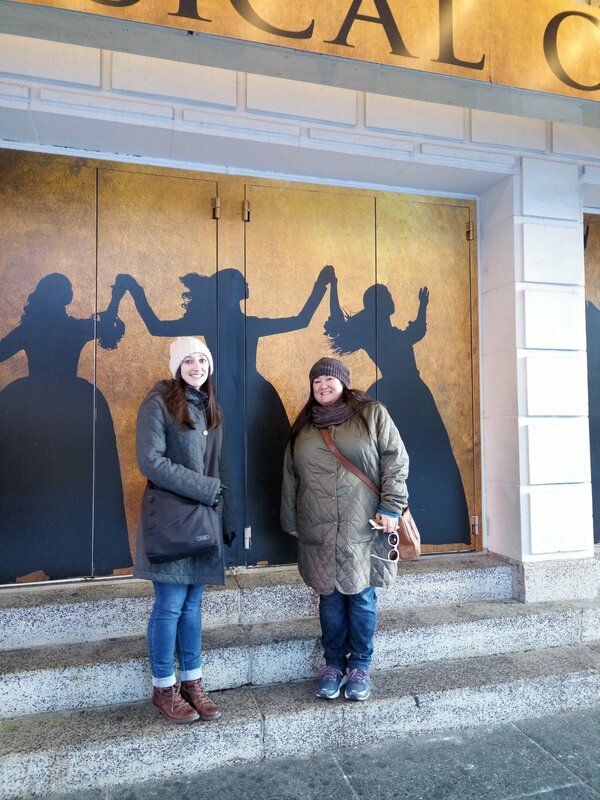 And our last night in the city, we went to the Richard Rodgers Theatre and saw Hamilton. 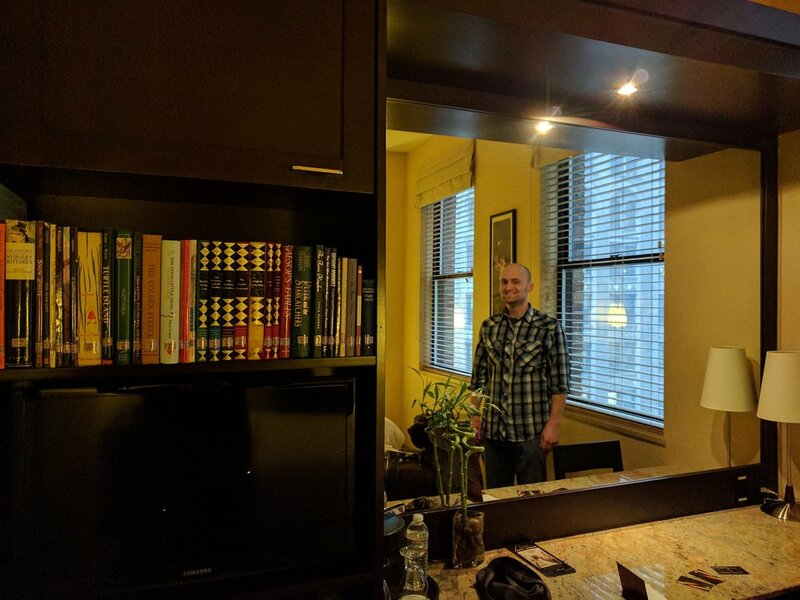 We stayed in the Library Hotel in midtown Manhattan. It is exactly as amazing and awesomely perfect as it sounds. There are books EVERYWHERE. In the lobby, in each guest room, and in the Reading Room, where they also serve breakfast and complimentary wine and cheese every day. Yeah. I was sorely tempted to steal this ARC off the front desk. It was just sitting there! What kind of hotel has ARCs sitting around the lobby?! Each room has a literary theme. Adam and I were in the fairy tale room. :) Even the “privacy please” door hangers were bookish. One of the first things we did was journey downtown to The Strand, which famously claims to house 18 miles of books. We were there on a busy Sunday, and the crowds were slightly overwhelming and the narrow spaces between shelves a bit crowded for this Midwestern gal who prefers wide-open spaces, but wow, talk about book overload! While there, I found a copy of Wake by Anna Hope, which has proven notoriously hard to find. I have been on the hunt for it since reading The Ballroom last year and loving it. I was a *bit* excited to get my hands on a copy. Belinda found herself an autographed copy of a book by one of her favorite authors (who has passed away, so an even rarer find! ), so The Strand definitely earned our enthusiastic endorsement. 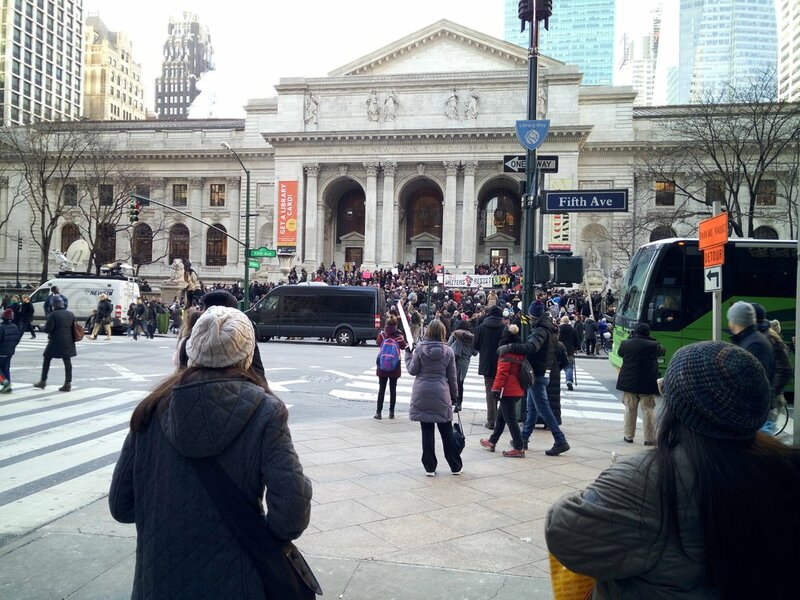 The New York Public Library was just two blocks from the hotel, and we happened upon a Writers Resist protest on the front steps on Sunday afternoon and stood a while to listen. Inspiring stuff--and further proof that artists (writers included!) keep showing up to do the work when things in our world get tough. #LouderTogether, indeed! On Monday we went to see Hidden Figures, a movie based on the excellent book by Margot Lee Shetterly about the important (and historically overlooked) role played by black women working at NASA during the space race. It was so amazing to see such an inspiring movie on MLK Day! The theater burst into spontaneous applause several times. If you haven’t seen the movie or read the book, I highly recommend both. Tuesday was the day of the show! We tried to distract ourselves until 7:00 pm by touring the flagship New York City Public Library. Our charming tour guide took us around the various reading and study rooms and told us all kinds of fascinating historical tidbits (all in an adorable French accent). She quoted The Importance of Being Earnest (one of my favorite plays) and asked a trivia question that Adam got right (rarest baseball card--Honus Wagner). Good times! There are several statues behind the library--this is me with Gertrude Stein. From Adam: Taryn asked me to talk about the NYC trip, particularly the food and beer. As this was the main draw for me (don't tell Taryn it wasn't Hamilton...), I was happy to oblige. This was my #1 place I wanted to try. They had a Parmesan Garlic Pretzel that sounded quite intriguing and an utterly ASTOUNDING tap list. The standout for the evening for me was the FT4 by Rushing Duck Brewing Company, a beer/mead hybrid (braggot) with vanilla and cacao. Damn, son. Belinda and Taryn are both big Smitten Kitchen fans. Seeing as the author is a Manhattanite, we looked to her for food suggestions. One such suggestion was Motorino. Belinda and I each had a brunch pizza with fried egg and pancetta on top. Taryn had a margherita pizza that (thanks to her tiny appetite) I got to try too. We had to pick a place to watch the Kansas City Chiefs play (lose to) the Pittsburgh Steelers. Since the game wasn't going to end until after 11 EDT, we chose a place near the hotel. The food was shockingly good pub fare and the taplist was awesome. I think we drank basically every Brooklyn Brewery beer they had. Plus, they had Victory Brewing Company, one of the few bright spots out of Pennsylvania. Belinda wanted this for her birthday and boy was it a good choice. We shared a four cheese white pizza as well as the house special pizza that was some kind of fried hand tossed crust. Amazing. It was raining (of course) and the doors opened late (of course), but you can bet we would have stood a lot longer in the rain for a chance to see this show. We were FOUR ROWS from the stage! One big highlight: we saw Taran Killam’s Broadway debut as King George! He did great and got a lot of big, scene-stealing laughs. I think it took until halfway through the first act before I calmed down enough to really enjoy the show. I don’t think I’ve ever been so nervous to sit in the audience! But the singing and rapping are so perfectly spot-on, and the dancing (with the spinning floor!) is so crisp and mesmerizing, even someone as neurotic as me can’t help but be pulled in by it. As you might be aware, the second act of the show gets sad in spots, with Hamilton’s son dying in a duel, and of course his own death in the duel with Burr at the end. I kept it together through everything...until the final curtain call, when all the actors came up to the front of the stage to take their bows...and I lost it. I did a fifteen-second ugly cry while Adam kindly and non-judgmentally patted my back.